A paragraph by paragraph analysis of the report based upon information gained as part of my own investigation into this incident. I have drawn on two other external written sources, firstly, Marys own report published in SUPRs Cover-Up magazine and UFO Magazines report from the January/February 1997 issue, written by Tony Dodds with field investigations by Brian Rooney. It was 8 p.m. on a September evening in 1996, with still enough light in the sky for children to be playing outside. Mary and her friend Jane, two mothers in their thirties, were settling down for a gossipy evening watching television together. Mary's son Peter, aged ten. and Jane's daughter Susan, fourteen, were with them. When Mary realised that she had run out of coffee, the two women decided to get into the car and drive to the nearest late-opening shop, a few miles away in another village. They took Peter with them leaving Susan at home because she wanted to watch a programme on TV"
The first error which presents itself to the reader is that of the time (8pm) and the statement referring to the amount of available light. I took video footage at Newton of Falkland on the 23 September 1998 (exactly two years later) and by 7:30 pm the available light was fading fast. At 8pm the area around Newton of Falkland was almost pitch dark (my Hi8 video camera failed to register any light at all). Even with a near full moon, as it was that fateful night, cloud cover was recorded by the local weather centre as that of 6/8ths (their terminology, not mine) or 75%, which would have masked much of the moonlight. Especially as the cloud type was stratocumulus, a heavy rain bearing cloud. So Tony Dodds statement is inaccurate OR his time of event is inaccurate. Supporting this Mary has stated that they left Janes house to go for the coffee at 7:30 pm and not 8pm as is alluded to by Tony Dodds. that rate of darkening it was obviously not light enough at 8 pm for children playing. The next comment that I have highlighted is that by his own previous UFO Magazine article of the Jan/Feb 97 edition, he reports that the four witnesses are in JANEs house so why is it that Mary runs out of coffee? It would seem to me that it was Jane who had run out of coffee! The route took them along a remote country road in the quiet corner of Scotland where they lived, so they were astonished to see, as dusk fell around them, two powerful beams of white light illuminating one of the fields next to the road. As they approached, they could make out a dark shape in the sky, from which the light was coming. Mary halted the car, and all three of them watched in fascination. The field and a small plantation of trees next to it were flood-lit by 'the brightest light I have ever seen in my life' according to Jane. The remote country road is the B936 between the villages of Falkland and Freuchie, 2 miles apart, with the hamlet of Newton of Falkland approximately halfway between them. Approximately five hundred people live in these villages so its hardly remote and any researcher worth his salt would have visited the area to make sure of his facts before committing them to pen and paper, something which Mr Dodds has not adhered to. They all climbed out of the car to get a better look. They could make out the underside of a huge triangular-shaped craft with three red lights on each angle. It was silent, but in the distance the women suddenly detected the rumble of aeroplane engines. Suddenly the strange craft shot away, across the heads of the observers, at such speed that it appeared to jump a mile across the valley. Jane described it as disappearing and reappearing in the distance simultaneously. This error shows a lack of real investigative technique as I will show. Mary in her own recording of the incident stated that as they left the hamlet (Newton of Falkland) they observed the craft to be above and slightly beyond a farmhouse situated on the left of the road. 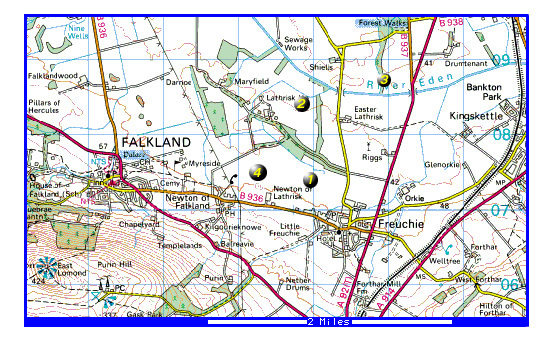 (Newton of Lathrisk Farm) These positions can be seen from the map and put the craft over a number of fields on the left of the road. Therefore as the valley runs east/west and there are hills to the south, the craft must have moved either northeast, northwest or north if it went across the valley. So it was impossible for the craft to have gone across the heads of the observers as this would have meant that it would have gone over the hills southwards and not across the valley. Also at this point in the encounter, Mary reported that the craft slowly turned away from us and glided away across the valley, not shot away as reported here. Peter was upset and started to cry. The two women shepherded him back into the car and comforted him, but they were preoccupied by the strangeness of what they had seen. Their initial supposition, that the object was an aeroplane or a helicopter had been completely demolished when they saw its size -about eighty feet across - and witnessed its silent manoeuvres at incredible speed. Peter did not start to cry until the next encounter, on the return trip from the shop in Freuchie as stated by Tony Dodds himself in his original UFO Magazine article and also agrees with Marys comments. So why has he changed his story ? The second highlighted comment here is incorrect as at no time did the witnesses state a size for this craft. In addition, the craft was 'eighty yards across' in Tony Dodds original article for UFO Magazine(UK), not eighty feet! They carried on with their journey, bought the coffee, and then returned along the same route, discussing who they should notify about the strange craft. When they reached the same spot on the road, Mary cut the engine again and they peered in the direction that the craft had disappeared. All three of them could make out a faint red dot of light. To their astonishment, it shot across the sky towards them and hung in the air over their car, 'as if it was aware of our presence', Jane said. Both the women were shrieking with a mixture of excitement and fear. Peter though, was terrified, and almost hysterical. As quickly as it had arrived, the spacecraft returned to its position in the distance, with only a faint red light as evidence of its existence. The sequence of events is out of synchronisation here, Mary did not stop the car until after the craft shot across the sky towards them, as is evident from her own account. Mary drove them home. They were shaken, but determined not to let what they had seen go unreported, despite Susan scoffing and insisting that she did not believe a word of it. They called the operator, hoping to be given advice as to who to ring, and were given the number of the UFO Hotline. Many telephone operators across Britain had the special number. I was not manning the Hotline that evening, but one of my colleagues advised the women to go back as quickly as possible to the scene with binoculars and a camera. Unfortunately, they had neither. But they returned anyway, taking Susan with them. Even Peter, despite his fear, insisted on going with them. By this time it was quarter to ten, and dark. Terrified, Mary slammed the car into reverse and shot backwards up the lane until she found a place to turn round, and then drove her frightened passengers home to Jane's house. As they discussed what they had seen and reassured each other that they were not going mad, Jane's brother arrived on his way home from work and offered to lend them some binoculars. Despite their fears, all four decided to go back once again to the scene. Down the back lane the witnesses did not reverse the car back down the lane as neither Marys account nor even Tony Dodds report in UFO Magazine mentions this. Indeed, if we take this statement here, as gospel then a complete section of Marys report is in error and Im sure that, given the accuracy of the rest of her account, I would consider that possibility a non-starter. This statement has also never been mentioned previously in any published document, and from Marys own account it is quite obvious that none of them left the relative safety of the car at that point in the encounter. So why this obviously false statement has been introduced here can only be surmised. However it does considerably add to the dramatisation of the account, if untruthful. The first time I spoke to Mary and Jane was the evening it happened, when they again rang the UFO Hotline, this time after their fourth and final encounter. It was late at night, and the Hotline had been switched through to me. Often at night we leave it on the answering machine, but when I heard the panic in Jane's voice I switched the phone over and talked to her. She was very distressed, and it took me some time to calm her down. In the end, all four of them slept together in the same bedroom, with the light on. It took a couple of weeks before any of them were happy to sleep in the dark again. My comments regarding the evening telephone calls have been made after Paragraph 6 and obviously paint this paragraph in a bad light. Enough said here, I think! I have spoken to both the women many times since the incidents, and they are still profoundly shaken by them. One family has moved away from the area completely. Neither of them wants to have their name published, they are not seeking publicity, and they would much prefer it if the events of that night had not happened. But they accept that they cannot undo them, and they want an explanation. There are times when I wonder why I give so much of my life to the fight to get this whole subject out in the open.' times when my own safety - and that of my family - is under threat, times when the combined forces of world governments seem too daunting. Then I think of women like Mary and Jane: ordinary people, going about their everyday business, with no interest in UFOs or aliens, who are suddenly sucked into the middle of these strange events. Not only do they face the trauma of what happened to them, but they face the frustration of not being able to speak openly about that night for fear of ridicule. The final paragraph starts with an obviously false statement, in that, after the publication of the UFO Magazine article by Dodds, (without the consent of the witnesses) the relationship between the witnesses on one hand and Dodds on the other went downhill and eventually all contact was severed. So for Tony Dodds to be still ascertaining that he is in contact with them is again false. He also hints that one family moved away as a result of this incident, but as we now know, the move was planned before this incident occurred. Dodds also knew that Mary was a previous subscriber to a UFO magazine and had read books on the subject prior to this incident. Therefore his comment with no interest in UFOs or aliens is again false as he was well aware of (and publicly commented upon) 'Marys' prior interest in UFO's. If this is a representative sample of the quality of investigative techniques (after 25 years as a policeman) then I'm surprised that there are not many more unsolved criminal cases. Fortunately I have a higher regard for the capabilities of our police! WHY does this case appear in his book three years later, giving the impression of a bona fide case? How many of the other cases he has investigated over the years have been embelished with dramatic 'untruths' and this leads us to ask also whether ANY of the 'stories' he tells are based on fact?